This island in south Dalmatia, is home to the largest pine forest in the Adriatic, large salt-water lakes and a national park. According to legend, Mljet was visited by Odysseus, who stayed there with the nymph Calypso. The Elephite islaands make a string of small islands close to Dubrovnik that formed part of the Republic in the 14th century. 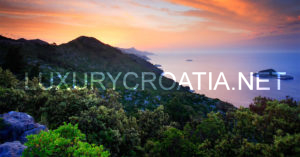 Only three are populated: Kolocep, Lupd and Sipan and were once favoured haunts of the aristocracy from Dubrovnik.If peace and quiet time is what you are after, Palagruza is the most remote of all the Adriatic islands, almost halfway between Croatia and Italy. Recent archaeological excavations revealed that the island was first visited by man in the 6th century bc. The lighthouse, built in 1875, is the largest on the Adriatic ­ and you can stay there. 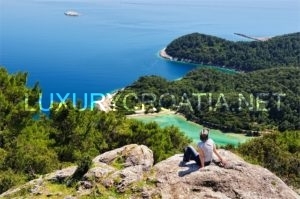 Mljet is beautiful island that is covered by a dense Mediterranean forest. The sea around the island is rich in fish and marine life. Mljet is also well known for it’s two salted lakes – Veliko and Malo Jezero that are located at the north end of the island. On small island in the middle of Veliko Jezero lake, there is old Benedictine monastery. Beside beach Saplunara (on the south of the island) , Veliko and Malo Jezero are favorite swimming spots for locals and visitors alike. 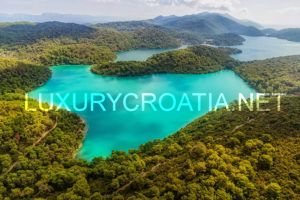 North- west part of the island of Mljet is also one of Croatian National Parks, and is therefore, one of the favorite destinations for travellers. 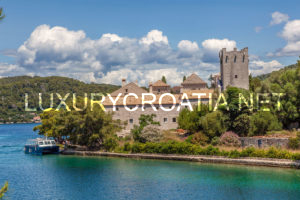 Mljet National Park covers the entire north-west part of Mljet Island.It is large are that borders two salt water lakes – Large and Small Lake. The Lakes stretch for about 4 kilometres. Right in the middle of the Large Lake there is a small island Melita with large building of former Benedictine monastery. The monastery’s building is now café/restaurant. The small island is connected by boats that sail there from both sides of the lake. large and small lake are two salt water lakes that are part of Mljet National Park. The lakes are interconnected by a narrow canal. They are also connected to the sea by narrow passage.